Abyssins are a nomadic and savage species from the planet Byss. They are distinguished most obviously by the single large eye centered prominently on their foreheads. They are also notoriously hard to kill, possessing incredible regenerative abilities that allow them to recover from virtually any non-fatal wound. The Abyssins' uncanny resilience has no doubt contributed to their violent culture. While bloody conflicts between warring tribes are all too common, casualties from these skirmishes are surprisingly few. Their fortitude makes them ideal hired muscle, and they often find work throughout the galaxy as mercenaries and bodyguards. The Coruscanti expression "cheerful as an Advozse" refers to the well-known pessimism of this horned sentient species. Advozsec come from the geologically unstable Mid Rim world of Riflor, which has suffered groundquakes and volcanic eruptions throughout its history. Advozsec, therefore, often witness their cities' destruction by natural disasters, and have become accustomed to expecting the worst. Advozsec's distinctive black eyes allow them to cope with the high quantities of volcanic ash in Riflor's atmosphere, providing specialized tear ducts and excellent vision in low light. Riflor's ash also nourishes a surprisingly wide variety of plant life, allowing the strictly vegetarian Advozsec to enjoy a varied diet. In the Republic, Advozsec are known as gifted starship engineers and reliable, if dour bureaucrats; to the Empire, their adaption to harsh environments--and cheap diet--make them appealing mercenaries and servants. Anomids are perhaps most easily recognized for the vocalizer masks they wear over their mouths. These units, while not necessary for breathing, are necessary for Anomid speech, as Anomids do not possess vocal chords and typically communicate with each other using a six-fingered sign language. Wealthy and adept at technological innovation, Anomids can be found far from their homeworld of Yablari serving as merchants, scientists and engineers. As a species, Anomids have traditionally allied themselves with the Republic, but individual Anomids can be found embedded with any number of cultures and organizations--including the Hutt Cartel. Arcona are a reptilian species from the desert world of Cona. Although their large eyes are their most distinctive feature, Arcona actually have poor eyesight, relying instead on the powerful scent organs on their tongues and an ability to perceive body heat. Due to the heavy concentrations of ammonia in their homeworld's atmosphere, Arcona cannot survive without ammonia supplements when away from home. Highly social, Arcona live in tight-knit nests where the needs of the group always come before those of the individual. This mentality is so ingrained that many Arcona alone in the galaxy still refer to themselves as "we" rather than "I." Cathar are a feline humanoid species native to the planet of the same name. They are normally covered in fur, although variations in the genetic baseline have expressed themselves as at least two distinct subspecies. Cathar are noteworthy hand-to-hand combatants, possessing retractable claws, strong physiques and natural agility. It was the Cathar reputation for martial prowess that drew the Mandalorians to besiege their homeworld several centuries ago. Despite their valiant resistance against the remorseless invaders, the native Cathar were virtually exterminated. Out of millions, only a few hundred escaped the Mandalorians' attack and fled to Republic space. In the time since their near-extinction, the Cathar have rebuilt their numbers to become common faces on Republic worlds. The Jedi Order, Galactic Senate and Republic military all claim numerous proud and loyal Cathar among their ranks. It is rare to encounter a Cathar who doesn't actively despise the Sith Empire--and especially its Mandalorian allies. Chagrians are amphibious beings with distinctive horns that evolved on the watery planet of Champala. Individual Chagrians are raised as tadpoles in pools of water within their family homes; upon gaining their adult forms, they retain the ability to breathe underwater but lose their sense of taste. Due to the unstable history of Champala's star, Chagrians also have a natural resistance to radiation. Chagrian society is largely peaceful. Champala's government is famous for being even-handed, ensuring a high quality of life for all its citizens while showing special favor to none. This mentality is often borne out in Chagrian individuals; in Republic politics, Chagrians are often painted as naive idealists by their opponents, but they can be fiercely devoted to their constituents. Natives of the planet Vinsoth, the Chevin are long-snouted, stubby-legged aliens known for their quick intelligence and underworld dealings. The most famous Chevin gangster was the slave Adamar Kirb, who managed to establish his own cartel on the Hutt-dominated world of Nar Shaddaa. While his cartel eventually broke apart into many smaller gangs, his influence is still felt. Because of their business savvy, underworld connections and starship expertise, the Empire considers the Chevin a useful, if weak, potential ally in the ongoing galactic conflict with the Republic, though as with most aliens, most of the Chevin within the Empire are slaves. The Chiss are a proud and highly intelligent species, valuing a knack for strategy and subterfuge over brute force. Although isolated in the Unknown Regions of the galaxy within their so-called "Chiss Ascendency," the Chiss were singled out by the Empire as potential servants and allies because of their outsider status and their relative lack of moral qualms. It is not that Chiss are by nature evil, but that they value pragmatism and efficiency and recognize both those qualities reflected in the Empire. While as a nonhuman, non-Sith species, Chiss are regarded as second-class citizens within the Empire, the Chiss Ascendancy is permitted self-governance and supporters of a more diverse Empire often use the Chiss as an example of what the Empire can accomplish by welcoming other species. A few rare Chiss have even achieved official rank in the Imperial military and Imperial Intelligence. A highly intelligent and voracious insectoid race, Colicoids are relatively isolated in the galaxy, but their dedication to droid design and advanced technology have put them at the cutting edge of scientific research. They are not aggressive, strictly speaking, but they have little regard for other species despite their robust mercantile operations. To Colicoids, the technology trade is a useful means to an end... but a mildly distasteful one. Dedicated also to the improvement of their own species, a group of Colicoids calling themselves the Creation Nest aided the establishment of an experimental facility for mutating their own kind in Balmorra's so-called "Bugtown." They found that their mutated "cousins" were able to metabolize the toxic waste on the planet and made excellent, if unpredictable, weapons. The Colicoid emissaries were not deterred when Bugtown was overrun, hoping to continue to perfect the experiments in the future (albeit without the Balmorrans' aid). As fearsome as they are scarce, Dashades are the hulking survivors of a long-dead planet. Their homeworld, Urkupp, was destroyed a millennium ago, leaving scant few of their kind left; a live Dashade is a rare sight these days. Prior to Urkupp's destruction, they were feared for their inherent resistance to the Force; Jedi and Sith alike often found their powers useless against the Dashades. While the Jedi generally preferred to avoid them, many Sith Lords took advantage of their unique abilities and employed Dashades as assassins to dispose of Jedi and rival Sith. Devaronians were among the galaxy's first species to develop interstellar travel, quickly branching out from their home planet Devaron to the Republic's founding worlds. Devaronian males are as well-known for their wanderlust as their striking physical appearance; they possess brightly colored--often red--skin, sharp teeth and long cranial horns; these combined attributes often conjure images of deadly, malicious predators and elicit discomfort among non-Devaronians. During the early days of the Sith Empire's return, Devaronians became targets of prejudice within outlying regions of Republic space, with less-educated citizens confusing the pureblood Sith and Devaronian biological traits. Before widely distributed images of true Sith purebloods put an end to the confusion, a few disreputable Devaronians gleefully took advantage of this change in reputation, only too happy to be feared. The diminutive and studious Drall are native to one of five inhabited worlds in the Corellian system and have been part of everyday life on Corellia itself for thousands of years. The Drall have long been Corellia's most trusted and respected record keepers--it is rumored that even the planet's crime lords rely on these small furry creatures for accurate accounting, and every library and museum of note keeps at least one Drall archivist on staff. Despite their animalistic appearance, Drall are highly intelligent beings of refined tastes. They are deeply respectful of others and expect to be treated in kind. The Drall are not a violent species and possess little military training, but their detailed knowledge of Corellia is proving invaluable to Republic forces. Duros are among the most common and well-traveled aliens in the galaxy. One of the founding species of the Galactic Republic, they are known for their role in mapping the earliest hyperspace routes and pioneering hyperdrive technology; to this day, the Duros diaspora is rich and varied, and modern Duros are as frequently soldiers as they are mechanics or moisture farmers. The Duros homeworld, Duro, is located on the Corellian Trade Spine, at the nexus of two vital trade lanes. Famous Duros include the smuggler Sol Vara, who outraced Exar Kun's forces during the Great Sith War to bring food to the refugees of Aduba Six. Not all Duros are wildly successful, however; on Nar Shaddaa, many Duros live in poverty under the rule of the Hutt Cartel, and on Dromund Kaas and other Imperial worlds, Duros are often used as slaves. According to ancient warnings carved into the walls of Belsavis prison, the Esh-kha were once one of the most feared species in the galaxy. In the distant past, they rose from their isolated homeworld and cut a swath of destruction across countless systems. Entire species were hunted to extinction. This marauding was only stopped when the Rakata "Infinite Empire," which had lost dozens of its slave worlds to the Esh-kha, mustered its titanic military against them. The Esh-kha were imprisoned in stasis beneath the surface of Belsavis--conscious, but immobile--and left in darkness for thousands of years. Since the security of Belsavis has begun breaking down, the Esh-kha have resumed their campaign of ruthless expansion and zealous combat. They appear devoted to releasing all of their kin on the planet, and spreading as much chaos as possible in the ancient prison. With every hour that passes, they recover more technology and strange weapons; it is only a matter of time before they take to the stars again. An oppressed and miserable species, the Evocii were once Hutta's sole inhabitants. They were a primitive people, existing in small tribes and possessing basic technology. Then the Hutts came, exchanging their advanced machines for Evocii land until they had bought up the entire planet. Now the Evocii are enslaved, preserved only to serve their corpulent masters' whims. While a few brave Evocii actively oppose the Hutts' tyranny, most have resigned themselves to a life of servitude. The Evocii are generally found in small, impoverished tribes on Hutta and Nar Shaddaa, though a lucky few have managed to escape the Hutts' influence and carve a life for themselves elsewhere. Fierce creatures with an unrelenting hunger, Flesh Raiders are believed to be Tython's only sentient natives. They are at least partially intelligent, capable of building shelters and assembling basic weapons from scavenged technology, but attempts to communicate have all ended violently. Known for devouring their prisoners and any animals they come across, the Flesh Raiders were formerly content to live in their primitive, bone-strewn camps in the hills. More recently, the expansion of the Jedi and the defenseless Twi'lek Pilgrims seem to have drawn the Flesh Raiders into the valleys. No one knows where the Flesh Raiders came from. Some speculate they were once a civilized people, driven to cannibalism and madness over years of isolation. Others fear they are the result of dark side experiments. Whatever their origins, the Flesh Raiders have only grown more powerful and numerous over the years, and they are quickly becoming a blight on Tython. Short, squat humanoids, Gamorreans are easily identifiable by their greenish skin and porcine features. On their homeworld, they live in clans, where the male boars serve exclusively as warriors while the female sows tend the day-to-day affairs like farming, raising young and crafting weapons. Known for their physical strength and endurance, Gamorreans are generally considered a species of below average intelligence. Unable to speak Basic because of their physiology, most Gamorreans are still able to comprehend it and find a place in the galactic community as soldiers, guards or mercenaries. Due to their reputation for violence and brutality, they are often employed by crime lords, gang leaders and various other criminal elements. The Gand are a keen-eyed and sturdy species of insect-like humanoids. Comprised of over a dozen subtly distinct subspecies, several types of Gand require breathing apparatuses to survive outside the ammonia-rich atmosphere of their homeworld. Despite this handicap, Gand make some of the best bounty hunters and trackers in the galaxy, and the art of the hunt is an integral part of Gand culture. The most revered Gand profession is that of Findsman: Part-shaman, part-bounty hunter, a Findsman uses a combination of ritual and skill to track his prey and bring him to justice. Under other circumstances, the Gand's skill as hunters and natural physical hardiness might have led them to become a proud race. However, Gand are noted for being humble and self-deprecating. Most Gand refer to themselves in the third person, as Gand culture dictates that an individual's identity must first be earned. Only the most notable Gand ever call themselves "I." A rare and reclusive species, Gen'Dai are virtually immortal. Living for thousands of years, they possess distributed nervous and vascular systems and lack any vulnerable vital organs. Combined with their natural regenerative abilities, they can survive almost any injury, including total dismemberment. Despite their resilience, Gen'Dai typically wear heavy armor to give structure to their sinewy, boneless forms. Abandoning their homeworld millennia ago for unknown reasons, most Gen'Dai now lead a nomadic existence. Believing in the perfection of permanence, these nonviolent philosophers see change as an illusion; as a result, Gen'Dai rarely take an active role in anything, preferring to remain unobtrusive observers as galactic history unfolds. Some Gen'Dai suffer mental deterioration as they age. This leads to a pronounced increase in violent tendencies, and some of the afflicted eventually become mercenaries or bounty hunters. Most documented Gen'Dai encounters involve these rogue individuals, giving the species a somewhat unfavorable and undeserved reputation for viciousness. An insectoid species with physiologically distinct subgroups, most Geonosians are four-limbed bipeds. Often categorized as cruel and barbaric, they possess an inherent talent for engineering and technical design and a complex set of cultural traditions. On their homeworld, the Geonosians live in hierarchical hive societies broken down into castes. The Geonosian aristocracy has unquestioned control of the workers and the soldiers, brutally managing the lesser castes as befits the aristocrats' whims. Rebellion is nearly unthinkable, given the Geonosian instinct for hive preservation, and advancement in the hive is extremely difficult--often earned through ritual gladiatorial combat. Rumors of a queen caste arise among outsiders periodically, but if queens exist, the Geonosians keep them well hidden. Most Geonosians encountered away from their homeworld are outcasts or warrior scouts; either way, they are typically arrogant and selfish, with little regard for the lives of other species. An aggressive species of humanoids found exclusively on the world of Voss, the Gormak have an amazing ability to comprehend highly advanced technology and adapt it to their specific needs. From bits of scavenged electronics and discarded equipment, they can construct tools, machinery... even deadly weapons and cybernetic implants. Aside from their affinity for technology, the Gormak's most notable feature is their hatred of the Voss species. The Gormak view the Voss as abominations that must be purged from their homeworld, and they are quick to extend this animosity to newcomers from the Republic and the Empire--like the Voss, these newcomers are all "outsiders." The Gormak population is estimated to be in the millions, spread across the planet, but so far their tribal, warlike nature has kept them from uniting against the Voss. Yet over the centuries, the Voss have had to constantly fight against the Gormak to survive--and developed a hatred just as strong as the Gormak's. Gran are a typically peaceful and reflective race physically characterized by their three eyestalks and long snouts. Traditionally highly communal, Gran found away from their home planets often stray from the stereotype; high-profile Gran outcasts have earned the species an unfair reputation as thugs, shady dealers and underworld enforcers. In reality, Gran appear in all walks of life--particularly within the Republic, where their generally calm demeanor, matched with their intimidating appearance, has made them excellent negotiators. This is not to say that all Gran are equally calm--one famous group of Gran gangsters was responsible for the deaths of thirteen rivals on Hutta after a fight over territory broke out in the local cantina. Known for their bizarre and wonderful technology as much as their unusual cephalopodic anatomy, the Gree are one of the oldest species in the galaxy. Their civilization once flourished in the Outer Rim, though the glory days of their people ended thousands of years before the rise of the Republic. In modern times, with much of their history forgotten and the greatest achievements of their people lost, most Gree live in seclusion in the Enclave--a mid-sized region of space carefully isolated from outside contact. However, the Gree reputation as engineers and artisans is still unmatched. Genuine Gree technology is worth a fortune to collectors and researchers--though few Gree would part with such treasures, preferring to lend their skills instead. Houk are massive, muscular humanoids native to the planet Lijuter. Never developing starship technology of their own, they emerged into the greater galaxy after initial contact with Vaathkree traders during which they offered their services as laborers and bodyguards. Often taken as mindless brutes, Houk are noteworthy for their strength and short tempers but can be surprisingly cunning; nonetheless, Houk prefer to solve problems with violence, and see no reason to be bound by treaties or contracts. Their natural strength and resilience means Houk gladiators are in high demand, especially for arena masters who can't afford a rare Wookiee combatant. A Houk named Torog became famous in the Besberra arena after fighting off waves of opponents and wild beasts for five hours, then dropping dead. This alone wasn't remarkable, until a post-mortem showed that for four of those hours, Torog had been fighting with a broken neck. A species of large, amphibious gastropods, Hutts are noted for their vast appetites and widespread cultural involvement in organized crime. Their bodies average three meters in length, with large eyes and wide mouths offset by comparatively small upper appendages. Corpulence is a favored trait among Hutts, who believe that greater body mass indicates greater success and riches. Although Hutts are biologically hermaphrodites, many take on the gender roles of other species; scientists and sociologists disagree on the reason for this. Hutts are also considered one of the longest-lived species in the galaxy, with several documented individuals living for more than one thousand years. Culturally, Hutts favor entrepreneurial pursuits over direct action or labor. A vast number of these pursuits are based on illegal activities, with some Hutt clans constructing vast criminal empires that operate across numerous worlds for centuries at a time. Pejoratively called "hammerheads" for their distinctive skulls, Ithorians are a peaceful mammalian species with two mouths and four throats. Their native language--which other species often find melodious but impossible to reproduce--resembles music rather than speech. Ithorians are devoted environmentalists and staunch pacifists. They evolved on the beautiful jungle world of Ithor, eventually moving into floating "herd ships" to avoid disturbing the native flora they call "Mother Jungle." Their experience building herd ships allowed the Ithorians to become one of the earliest spacefaring species, and they live on city-ships to this day. Every five years, Ithorians gather for a Meet, where they exchange news, debate important issues and come together as a culture. Although not particularly technologically advanced, no species is more capable at restoring damaged ecologies than the Ithorians. Many Ithorian herds have begun visiting worlds whose biospheres were damaged in the Great War, encouraging the worlds' recovery or transplanting endangered flora and fauna to new homes. Native to Tatooine, the diminutive Jawas are often dismissed as scavengers and thieves. However, this description minimizes the resilience of the species, which has managed to thrive in the harsh desert environment. Rodent-like in their features, Jawa are rarely seen without the brown robes and facial coverings that protect them from Tatooine's twin suns. They live in nomadic clans each ruled by a female shaman, and there is surprisingly little rivalry between the clans, as each limits scavenging to its traditional territory. Necessities not found or built by the clan are purchased from offworlders' settlements, where Jawas' skills as tinkerers whose work endures the desert heat are reluctantly valued. Annually, all the clans gather in the basin of the Dune Sea to exchange goods and share ideas. This is also a common time for clans to exchange sons and daughters of age. This practice increases genetic diversity within each clan and solidifies the unspoken alliance among the Jawas as a whole. The proud, honorable and deadly Kaleesh warriors are a relatively recent arrival to the civilized galaxy, but both the Republic and Empire already respect the species for its martial talent. Thanks to their imposing bone masks, Kaleesh are also highly sought-after as enforcers by status-conscious members of the criminal underworld. Wealthy Hutts employ Kaleesh bodyguards as a pointed warning to any upstarts who might challenge the Hutt Cartel's power. Individual Kaleesh project a stoic fatalism mixed with a surprisingly deep spirituality. Their core belief is that those who perform great deeds in life become immortal, godlike beings upon their deaths. Kaleesh warriors therefore seek only the greatest challenges to overcome. Anything less means risking an ignominious--and permanent--demise. The Kel Dor are a humanoid species noted for a physical appearance others diplomatically describe as "an acquired taste." In addition to unattractive facial features, Kel Dor wear elaborate mask-like breathing apparatuses when entering oxygen-rich environments. The combination of their alien appearance and strange technology leads unenlightened beings to naturally mistrust Kel Dor. Thousands of years before they joined the Galactic Republic, Kel Dor developed their own Force-using order of "Baran Do Sages." These men and women advised rich and powerful families, using the Force to guide their patrons to strength and prosperity. However, the Baran Do Sages faded into obscurity once the Jedi took over training the Force-sensitive Kel Dor. Kel Dor inhabit all walks of Republic life, from powerful Jedi Masters to lowlife bounty hunters. Culturally, they tend to view life in black-and-white terms. Kel Dor aren't above acts of vigilantism, meting out personal justice if they believe a grievance warrants it. The original inhabitants of Alderaan, the insectoid Killiks spread across the planet and throughout neighboring star systems millennia before the foundation of the Republic. By the time human colonists found Alderaan, however, the Killiks had long since migrated into deep space for reasons unknown; the only evidence of their existence was their empty hive mounds. In fact, a few Killiks had remained behind on Alderaan and lived in hibernation deep underground. Every few hundred years, these Killiks would emerge and come into conflict with the colonists before retreating and sleeping once again. The Alderaanians viewed the Killiks as monsters out of legend, and no one's certain how the Killiks view the Alderaanians. Killik society is comprised of a collection of hive minds--some violently territorial, others gentle and reclusive. Individual Killiks possess no sense of identity or self, and each would unquestioningly sacrifice its life for the benefit of its nest. As a result, Killiks cannot comprehend the value other species place on individuals, making them difficult to interact or negotiate with. They do, however, have values of their own, creating beautiful works of art and engaging in complex ritual behavior. The strength of the Killik hive mind is such that it can even absorb individuals from other species, altering their brain chemistry so that they respond to the will of the nest. These transformed individuals are commonly called Joiners. The Krex are a hardy reptilian species with a knack for survival. Despite their fearsome appearance, the Krex are most widely known as explorers, pioneers, and colonists of hazardous and far-flung worlds, where their natural regenerative properties and tough skin are of great benefit. Still, it's not uncommon to find hardened Krex putting their abilities to work in other dangerous professions. Interestingly, the Krex homeworld of Rokirex does not appear to be their actual planet of origin; the ancient mythology of the Krex refers to their ancestors exclusively as "travelers", and no examples of similar species can be found anywhere in the Rokirex archaeological record. This has led some biologists to theorize that they are actually descendants of long-lost Chistori colonists who gradually developed into a distinct genetic line. The Kubaz are long-snouted aliens renowned for the secretive hand signals they use to communicate with each other. These signals, combined with their ability to see even with very little light, make them experts at covert communications, and as a result, they are commonly employed as espionage agents by forces on both sides of the galactic conflict. Even in the underworld, Kubaz are used to broker deals in silence, in the shadows. One of the most famous Kubaz was a triple agent who worked for the Hutt Cartel, providing them with information on both the Republic and the Sith Empire so the Hutts could reap the rewards of the conflict. It doesn't require much of an imagination to see that the hulking Massassi are genetic cousins to the Sith Pureblood. Both share the same distinctive skin tones, skeletal ridges and body tendrils. Both are also Force-sensitive, though the similarities typically end there. Nourished by the dark side of the Force, the yellow-eyed Massassi have developed a culture based around hunting, combat and violent ritual sacrifice. On Yavin 4 in particular, the Massassi are markedly different from Purebloods. These impossibly strong warriors have developed dense and sharp claws on their hands and feet, and their intellect has diminished to the point that they rely almost entirely on animal instinct and use grunts to communicate. Their society, such as it is, has devolved into true barbarism. Hailing from the oceanic planet Dac, the amphibious Mon Calamari are among the Republic's most creative and intelligent member species. Many famous inventors, artists, military leaders and Jedi have emerged from this people. Less noble-minded Mon Calamari have made equally successful criminals and gangsters. Physically, Mon Calamari possess dome-like heads, large eyes and long webbed hands. They are fast swimmers who can hold their breath for long periods, although wounded or panicked Mon Calamari are still capable of drowning. Their eyes can swivel independently, allowing them to focus on two different areas simultaneously. Despite only joining the Republic within the last millennia, Mon Calamari have earned a reputation for being its most enthusiastic supporters. Folk wisdom says that when a Mon Calamari joins a cause, its eventual victory is assured. Although they are not a warlike race by nature, Mon Calamari are more than willing to fight for ideals they believe in. The newest of Darth Malora's creations, the mutant Geonosians deployed on Ossus are actually a hybridization of multiple species drawn from across the galaxy. Most of the original subjects were purchased as adult slaves or in egg or larval forms from a secretive group of Hutt gourmands who have no objections to devouring sentient species (when properly prepared). Using a combination of genetic engineering and Sith alchemical techniques, Malora created Geonosian warriors with the thick armored carapaces of Acklays, the rapid reproduction of Killiks, and the heightened sensory capabilities of the Melitto. Only the barest amount of sentience remains--just enough to operate weapons such as blasters and vibroblades. When designing her mutated Geonosian super-soldiers for the assault on Ossus, Darth Malora ensured that her new army would be both self-sustaining and nigh-impossible to eradicate. Given their insectoid nature, the key to Malora's success was in the careful creation of the mutants' queen. Natural Geonosian queens have poor mobility and defend themselves only via indirect means; thus, Malora chose to splice her queen's internal structure into the bodily frame of a Colicoid, tremendously increasing the creature's speed and natural defensive capabilities. Like the soldiers it brings to life, the mutated queen also has a reinforced carapace, enhanced sensory organs, and a vicious temperament. The resulting hybrid may well be Malora's most dangerous creation. Amphibious humanoids from the planet Glee Anselm, Nautolans are distinguished by their tentacle-like head-tresses. Because of its primarily aquatic surface and its location off the major hyperlanes, only a handful of outsiders have ever visited Glee Anselm; as a result, little is known about Nautolan culture on their homeworld, though extrapolations can be made from those individuals who venture out into the greater galaxy. Despite their aquatic origins, Nautolans can breathe air and are completely at home on land, and they can be found in a wide variety of professions. They have a reputation for being both smart and practical, and the existence of several Nautolan Jedi speaks to an affinity with the Force. With the arrival of the Empire, the Nautolans fought alongside the Republic, although some among them fear this will lead to unnecessary suffering for their people. Around the time of the foundation of the Republic, a group of Duros explorers led by Chal Haan colonized the planet Neimoidia. Over millennia, the conditions of their new colony led these Duros to evolve into a separate species: Neimoidians. These green-skinned, red-eyed beings grow from grubs in communal hives, where they spend the early years of their lives competing for food. Those who cannot find or steal enough to eat quickly starve, a process which ensures that weakness is weeded out early. Personal greed is seen as acceptable and even desirable in Neimoidian culture, and while Neimoidians are known as capable entrepreneurs and administrators, their opponents paint them as deceitful, lazy cowards. Neimoidians do rely heavily on advanced droids for all but the most important tasks--freeing them to pursue elaborate political games for social rank or increased profits--but Neimoidian investors have also aided the Republic's economy in hard times. The Senate therefore tolerates Neimoidian bribe-taking and backroom trading... up to a point. The name "Nikto" is an umbrella term; these muscular, reptilian beings technically consist of five distinct subspecies. Each evolved on the planet Kintan after a dying star, M'dweshuu, bombarded their world with radiation. A cult devoted to this star arose, and exerted a totalitarian hold on Nikto society until the Hutts discovered Kintan and destroyed the cult's stronghold in an orbital bombardment. The Nikto rallied to the Hutts under the Treaty of Vontor and the fortunes of the two species have been intertwined ever since. Nikto are gifted fighters, often serving as enforcers for the Hutts. Those who leave Kintan or the Hutt Cartel are often "mixed-breeds" who show characteristics of more than one subspecies and are subsequently reviled by their own people, but some are members of modern Nikto cults--often violent groups that trace their roots to the original Cult of M'dweshuu, for good or ill. Built for cold weather, the blue-furred, long-nosed Ortolans are deeply private individuals who--thanks to their large ears and keen olfactory senses--possess a deep appreciation for music and food. They can be found in small numbers throughout the galaxy, filling all walks of life, but they are best known as musicians and chefs. Although not expansionist by nature, Ortolans have occasionally attempted to found full-fledged colonies away from their icy homeworld of Orto. One such group arrived on Hoth several years back. The Hoth Ortolans keep mostly to themselves, but the increasing presence of Republic, Empire and pirate forces on their adopted world has made them wary. Despite a kinship with the Republic, they value independence and--more importantly--peace. The current situation on Hoth threatens both. Ten thousand years before the formation of the Republic, the Rakata ruled much of the known galaxy. War-like and cruel, strong in the Force and technologically advanced, they enslaved or wiped out every civilization they encountered. At its peak, nearly five hundred conquered worlds paid tribute to the Rakata Infinite Empire. However, the Rakata's rapid expansion came to an abrupt end when a strange plague swept through the species. Millions died, and most of those who survived lost their connection to the Force. Suddenly vulnerable, the Rakata were unable to suppress a massive outbreak of violent slave uprisings. The liberated worlds destroyed the creations and records of their defeated overlords, wiping out almost all trace and knowledge of the Rakata in the greater galaxy. A few thousand Rakata survivors--all that remained of the Infinite Empire--retreated to their hidden homeworld of Lehon, where they descended into barbarism. The Rishii have soared as their planet's dominant species for many thousands of years. Their powerful wings, honed talons and knack for mimicking the sounds of other living things make them natural hunters. While highly intelligent, they prefer to apply their smarts to reflective and societal matters over technological advancement. Content to lead simple lives in villages set atop high mountain peaks and grow their population at a glacial pace, the Rishii have no reason to war amongst themselves, though their ability to defend themselves from predators make them skillful combatants. Some Rishii have chosen to relocate closer to the outsiders who have colonized the world in recent years, the most adventurous among them integrating more fully and opting for the thrill of a pirate's life. Rodians are a reptilian humanoid species hailing from the deadly tropical jungle planet Rodia. Their harsh and unforgiving natural habitat has shaped Rodians into an aggressively survivalist culture. A reputation for violent tendencies has pushed Rodians to the fringes of galactic society, as few other species trust them. The most noteworthy physical feature of Rodians is their large, multifaceted eyes, which allow them to detect another creature's body heat even in near-total darkness. This gives Rodians a natural edge as hunters, leading many to pursue careers as bounty hunters or even less-savory professions. The negative stereotyping of Rodians is mostly unearned, however. Many among the species have channeled their biological adaptations and cultural inclinations toward more productive paths. Rodians serve proudly in the Republic military and Jedi Order, standing united with humans and other species to oppose the Sith Empire. A violently xenophobic species from Tatooine, the Sand People are more formally referred to as the Ghorfa. Most at home in Tatooine's endless deserts and canyons, the nomadic Sand People survive by hunting and raiding larger settlements and by raising banthas as mounts and for food, milk and materials. To outsiders, they can appear incomprehensibly hostile--but while virtually all encounters with Sand People end in violence, their culture is more complex internally. Sand People have strict taboos against showing exposed flesh except in very rare and specific circumstances and keep themselves wrapped in heavy coverings. Those who violate this sacred custom are banished from the tribe; a fate that typically ends in a lonely death in the desert. Despite their insular nature, Sand People are known to adopt and raise young children of other species orphaned by their attacks. Once these orphans reach adulthood, they are encouraged to leave the tribe and return to their own people. The history of the Sand People is maintained through the tales of revered tribal storytellers. Many of their legends describe a golden age of technological miracles, seemingly indicating the Sand People were once a highly advanced civilization. This had led to speculation that the Ghorfa are descended from the now extinct Kumumgah species that lived on Tatooine roughly thirty thousand years ago. Selkath are a sleek, amphibious species native to the oceans of the planet Manaan. Diplomatic and family-oriented, they have traditionally been advocates of peace in the galaxy, taking a decidedly neutral political stance. Their homeworld is a major exporter (and formerly the sole source) of the medicinal fluid kolto, and it is the kolto trade that made the Selkath an influential force in the past. However, when the Empire first returned to the galaxy and launched its attacks on Republic worlds, Manaan was one of the first worlds to be devastated. A massive bombing destroyed most of the planet's surface infrastructure, driving the Selkath to their underwater cities. Since then, the Selkath have mostly been cut off from the larger galaxy; those who were offworld when Manaan was attacked have largely been stranded, and only a few Selkath--mainly ambassadors seeking aid for their devastated planet--have left Manaan since. Corellian folklore says that long ago, the Drall and Selonians chose their species' future paths--and where the Drall selected peaceful intellect, the Selonians claimed passionate physicality. Native to Selonia, the second planet in the Corellian system, the tall, wiry Selonians are perfectly adapted for hand-to-hand combat. Their needle-like teeth and claws make for impressive natural weapons, and even Wookiees respect these agile warriors' prowess. The immense Selonian population on Corellia immediately sided with the resistance when the Empire invaded the planet. However, the Selonians stubbornly resist using their underground tunnel networks to ambush or trap Imperial forces due to a cultural disgust for lies and subterfuge. Is it said that in war, truth is the first casualty; if the Selonians are unwilling to accept this sacrifice, they may fare poorly in the battles ahead. Although the name "Sith" is now used by the order of Force users who call upon the dark side, the term originally referred to a Force-sensitive species of red-skinned humanoids. The term "Sith pureblood" is now used to distinguish between those descended from the species and the order itself. The Sith species was discovered three thousand years ago on Korriban by exiled human Dark Jedi fleeing Republic space after their defeat in a war called the Second Great Schism. The Dark Jedi quickly enslaved the primitive culture, and over many generations, the two groups intermingled. Eventually, the elite ruling class of Korriban consisted almost exclusively of the hybridized offspring of the Dark Jedi and the high priests of the Sith people. These offspring tended to exhibit the physical characteristics of their Sith parentage, such as red skin, yellow eyes, bony protrusions on the face or head, and fleshy tendrils dangling from the cheeks and chin. For a brief time, Sith blood was seen as a sign of weakness--but the modern Empire believes purity of heritage carries the strength of the Force. Genetically speaking, true "pureblood" Sith are virtually extinct, but red skin is still the mark of an Imperial--almost always a Force user--who can trace his or her ancestry into antiquity. Adventurous and outgoing, Sullustans are as comfortable seated at the controls of a ship as they are in the underground cities of their homeworld. Whether their affinity for navigation and exploration is genetic or cultural is a matter of some debate, but the end result is that Sullustans are found throughout the galaxy where they are heavily recruited as crew members on both civilian and military vessels. The planet Sullust is currently under Imperial control, a fact that does not sit well with the Sullustans themselves. Due to Imperial censorship of planet-wide communications, little is known about resistance efforts on the surface. However, Sullustans in the rest of the galaxy are almost universal in their support of the Republic, with most eager to do anything they can to aid in the eventual liberation of their homeworld. The Talz are a strong, warlike and clannish species, ideally suited (due to their copious fur) to fighting in cold-weather climates. Their essential sense of honor and decidedly inhuman appearance brings most Talz into alignment with the Republic in the fight against the exclusionary Empire, and many Talz have joined the Republic's crack Talz commando units, battling on Hoth and in other cold-weather theaters of war. Not all Talz believe that fighting for the Republic is the correct course, however. There are those whose bloodlust is not satisfied by taking out the targets the Republic assigns them, and who feel that they betray their clan by adopting a foreign master. Occasionally confused with Twi'leks, Togrutas are distinguished by multicolored skin pigmentation and large, hollow horns (similar in appearance to Twi'lek head-tails) that permit a Togruta to sense ultrasonic waves. These physical adaptations were required for Togrutas to endure and to hunt on their homeworld of Shili, which is dominated by large and deadly beasts. Togruta culture is tightly knit out of necessity, as individual survival there often depended on tribal unity. Because of their ingrained affinity for teamwork and togetherness, Togrutas are among the Republic's most loyal and dependable citizens. Indeed, a higher-than-normal percentage of Togrutas exhibit powerful Force sensitivity and serve in the Jedi Order. Some scholars speculate that the Togrutas' unique sensory adaptations and strong cultural bonds makes them more receptive to learning the ways of the Jedi. Possessed of tough skin, infrared vision and the ability to regenerate lost limbs, the saurian Trandoshans are highly evolved hunters often found working as mercenaries and enforcers. Their culture revolves around combat and belief in an all-knowing goddess called the Scorekeeper who grants "Jagannath points" for honorable kills. These points denote an individual's status in Trandoshan society and purportedly determine a Trandoshan's eventual fate in the afterlife; consequently, even outside of physical combat, Trandoshan society is extremely competitive. Trandoshans share their native star system with the Wookiee homeworld Kashyyyk, and the two species have a long and vicious history together. Trandoshans see the wildlife of Kashyyyk--including the Wookiees themselves--as choice prey, and the Wookiees readily and violently defend their beloved home from raids by Trandoshan hunters and slavers. Twi'leks are a humanoid species with long, prehensile head-tails called lekku--organs housing sections of the Twi'lek brain and specialized for communication through subtle motion. Twi'leks are native to the harsh world of Ryloth, a planet that has suffered from occupation by the Hutt Cartel in recent years; Twi'leks on Ryloth not forced to work in the mines are often taken as slaves, exported to markets throughout the Outer Rim. Millennia of dispersion into the wider galaxy, however, means that many Twi'leks have little or no sense of connection with their beleaguered homeworld; Twi'leks may be second only to humans in their ubiquity throughout known space. Nonetheless, many Twi'leks can't escape the shadows of slavery and the underworld--often, they find work with the same pirates, slavers and spice dealers who have traditionally oppressed their species. Twi'lek names vary dramatically, depending on whether the parents follow the old Twi'lek tradition of combining given and family name, or use the more common approach (separating first name and surname) used by many other species. Some Twi'leks eschew any surname altogether. Ugnaughts are small, hardworking humanoids with a knack for mechanical work. Living in close-knit tribes, they are native to the volcanic world Gentes, where they build cunning devices to help them survive Gentes's inhospitable conditions. Living in Gentes's thick atmosphere gives Ugnaughts some natural resistance to toxic gases, meaning they can work happily in industrial environments without protection. The Ugnaughts' small size and impressive technical expertise unfortunately make them prime targets for slavers. The Hutt Cartel alone is responsible for displacing entire Ugnaught tribes, putting them to work in droid factories or to maintain the Hutts' extravagant palaces. The Voss are a newly discovered humanoid species with a strong affinity for the Force--though they don't recognize it as the Force. Confined to a single city, Voss-Ka, on their homeworld, they possessed a pre-spaceflight level of technology until their recent discovery by the Republic and the Empire. Today, they have begun integrating outsider advances into their own culture, but remain isolated and backward compared to the rest of the galaxy. Voss society is difficult for outsiders to comprehend, as they are guided in everything they do by the infallible visions of their Force-using Mystics. This unwavering obedience is often misinterpreted as a stoic fatalism or a lack of emotion, but beneath their reserved words and placid exterior the Voss are a passionate and devoted people. The Voss share their world with the far larger Gormak population, and considered the tribal Gormak to be little more than beasts. While the Voss readily acknowledge the threat the Gormak represent to their society and constantly war against them, there is never any consideration given to wiping them out entirely--as Mystic law clearly states that the last Gormak must never die. Hailing from the Outer Rim planet Srilurr on the border of Hutt Space, the intimidating Weequays have served as foot soldiers and mercenaries for millennia. Weequay warriors under the command of Kossak the Hutt defeated infamous warlord Xim the Despot over twenty thousand years ago, securing the Weequays a reputation as one of the galaxy's toughest species. Veteran soldiers joke that Weequays can survive headless or heartless, but not both. Such exaggerations expose a dim view of Weequay intelligence that ignores the capable military leaders and wise Jedi Masters who have come from this proud people. 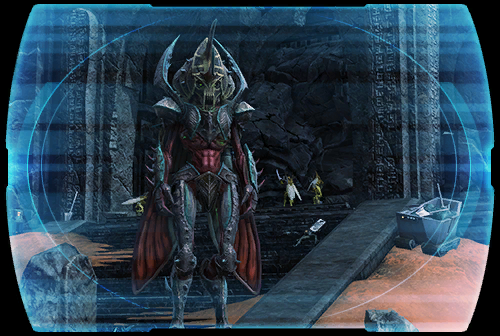 Zabrak are near-human sentients from the planet Iridonia renowned for their independence and wandering spirit. They have distinctive facial horns, whose number and pattern denote which subspecies an individual Zabrak belongs to. Most Zabrak wear ritual facial tattoos, which vary from simple lines to more elaborate patterns. The designs can mark significant events in their lives, or merely be a matter of personal preference. After discovering space travel early in their civilization, they quickly colonized worlds throughout the Mid Rim and gained a reputation as pioneers and explorers. Zabrak are also skilled warriors, engaging in inter-clan competitions to hone their talents; their physiology, which includes a secondary heart and some resistance to pain, gives them surprising endurance in battle.